Dragon Quest IV: Chapters of the Chosen finally arrived on DS, courtesy of Square Enix. Long-time Dragon Quest fans will be relieved to know that all their favorite game mechanics are still intact with a few upgrades to boot. Those of us who don't have a relationship with the game may find just another fantasy-based dungeon crawler that is difficult to save quickly when playing on-the-go. 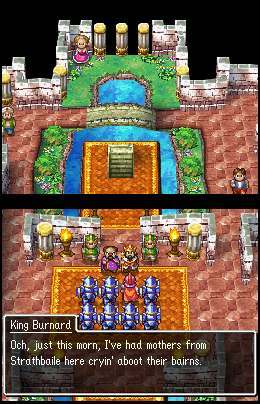 There are five interconnected stories in Dragon Quest IV: Chapters of the Chosen that follow several characters through their own tale until they meet you, the hero. As you progress, you'll learn about such avatars as Ragnar McRyan, Torneko, Alena and Boyra, all of which have their own class and abilities to contribute. By the time you reach the fifth and final story in the game, you'll have a stable of well-trained fighters. You can pack them all into a wagon and ride together through the wilderness while engaging in randomly activated turn-based battles. Aside from the occasional fight, you will uncover the secrets of several mysterious quests. When working on completing each adventure, you will find that the Day/Night cycle influences your search. However, this trick will not be apparent right away, and you may wander aimlessly until you figure it out. Many of the enemies from the Dragon Quest series make an appearance in this game, and fans will smile as they face the first of many slime monsters blocking their path. However, in the beginning, slime monsters are almost the only enemy you get, and combat becomes something that must be done, instead of something that we love doing. Thankfully, these battles don't last long; in fact, the length of your fight depends on how fast you are at selecting your actions. Beginning the game with Ragnar, your only choice is a sword attack, so each battle shouldn't be any longer than a few swings of the blade. When you finally have your wagon filled with fellow travelers, you can swap characters in and out of the wagon at any time (and that includes during a fight sequence). When it comes to experience points, all of your characters (even the ones who were not in the fray) receive a boost. We really appreciate this universal gain. Interacting with others around the world is almost like real traveling. The dialects of each region are represented in the text, and understanding what these foreign villagers have to say can be a mini-quest all by itself. Most of this interaction is done in towns around the map. It is here that you will do most of the bartering in the game at the trusty item, armor and weapon shops. If you are weary and wounded from battle, you can stay at the inn and heal up. Expect to be irritated by the item shop guy who won't let you buy more than one of the same thing at a time. When the need to save comes along, or if you want to revive a fallen comrade, you'll need to head to the nearest church in town. You can also quick save if you need to quit on the fly. In addition, you have the opportunity to found your own town in the game, and you can trade settlers from your mini city with friends in Multi-Card play. Though you may begin with just an outpost in the wilderness, soon you will have a bustling civic epicenter. 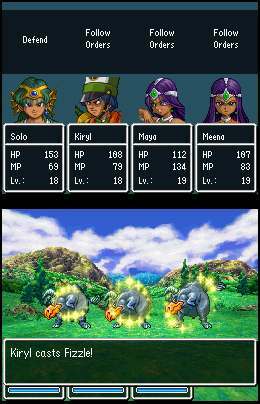 Dragon Quest IV: Chapters of the Chosen isn't a bad game, it just lacks anything that makes us want to cheer. The graphics are slightly improved with a new 3-D map, but most of the game features colorful 2-D animations reminiscent of the original Dragon Quest IV. If you have fond memories of it or you are an RPG fanatic, definitely check out this game. If you don't count yourself in those categories, just remember this: Dragon Quest IV is definitely worth a look and a rental, but the lack of innovation makes this feel like the same old quest. What's Hot: Quick battles, five separate stories, Boom Town, Day/Night Cycle. What's Not: Nothing new, strange accents, not much variety in beginning, can't buy more than one of something at a time.